Oregon Basketball, How Sweet It Is! The defense stole the show for the Oregon men’s defense on Friday and Sunday. On Sunday, Ehab Amin took over by creating a series of extra possessions for the Ducks. 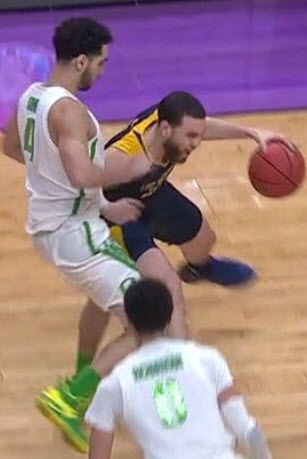 He had a save of a ball already out of bounds, slapping a rebound off an opponent’s leg, another offensive rebound and a steal so quick all six TV cameras missed it. Kenny Wooten had seven blocks, and the only easy bucket UC Irvine got at the rim was when Wooten’s shoulder hit the backboard on a block attempt. 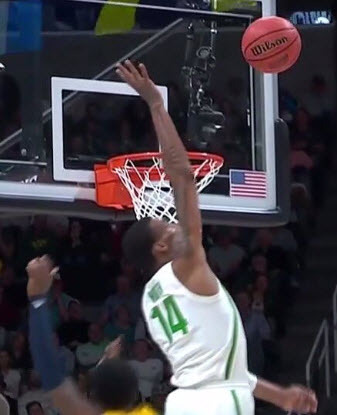 Defensive interference is what they called — another first for Coach Dana Altman’s program. Kenny Wooten was once again a terror in the paint. The Ducks harassed all-everything guard Max Hazzard into just four first-half points. Oregon’s defense was thriving because they were moving their feet and not reaching and fouling. Instead, they relied on their athleticism, length and cohesiveness to move as one unit from one defense to another. Payton Pritchard was tremendous on offense throughout the entire game. He controlled the tempo and was nearly perfect. Then, after all of this great play in the first half, Oregon was horrible for the first seven minutes of the second half against UC Irvine. Why do they constantly start halves by firing up threes? Louis King played like a freshman on a stage too big for him, Francis Okoro reached on defense, and Paul White felt the pressure and couldn’t hit a shot. Enter Amin again. He hit a three-point shot, took a charge in the open court, and hassled the Anteaters into a 10-second call before they could get it over half court. Then Amin caused two more turnovers, hit a three, and Oregon started throwing lobs. 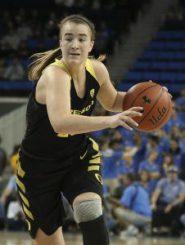 Pritchard followed with a step-back three-point shot, Amin banked a three-pointer in (and was fouled but it wasn’t called), and the Ducks flew away from the Anteaters. The Anteaters didn’t give up, they were just outmanned and outplayed. Amin is fueling Oregon’s aggressive defense. Virginia has terrific athletes and an equally great coach with four days to prepare for Oregon’s morphing defenses. Coach Tony Bennett will likely try to get one level behind Oregon’s first line of defense. The Cavaliers will pass the ball to a small forward at the free throw line. They will force Oregon’s big men to either come up and defend, or just allow the short, open jump shot. Oregon ran the same play with Dillon Brooks and Jordan Bell to perfection. If the defender comes up, the offensive player passes it to the teammate on the block. If the defensive help comes from the wing, they pass to the open shooter behind the arc. And if nobody comes out to defend they either drive or shoot. Oregon can defend it by using their length. They need to keep their hands down if they’re closing out from inside the key, or up if they close out from the wing. It’s not easy, but as you know, Oregon is really well coached. 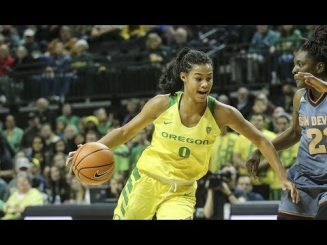 With Oregon down four in the second quarter in their game against Indiana on Sunday, Sabrina Ionescu simply took over the game. She hit two threes and converted one to a four-point play. Oregon never looked back. Ionescu is dominating opponents and the entire nation is noticing. Her most impressive play may have been a very simple pass. After a scramble for the ball, Ionescu came up with a loose ball and as she led the break, she threw a left handed lob pass up over the defender, perfectly in stride to Satou Sabally, who laid it in. Ionescu made that look pass look really easy. It isn’t. In the third quarter Indiana was forced to keep someone planted in the paint with Ruthy Hebard. Oregon did a terrific job of passing the ball cross court to open three-point shooters. Ionescu, Sabally, Erin Boley and Maite Cazorla all knocked down shots on good skip passes. The Hoosiers didn’t move well side-to-side as a group and the Ducks torched them for it. Great coaching. Great work in the film room. Great recognition as a group. 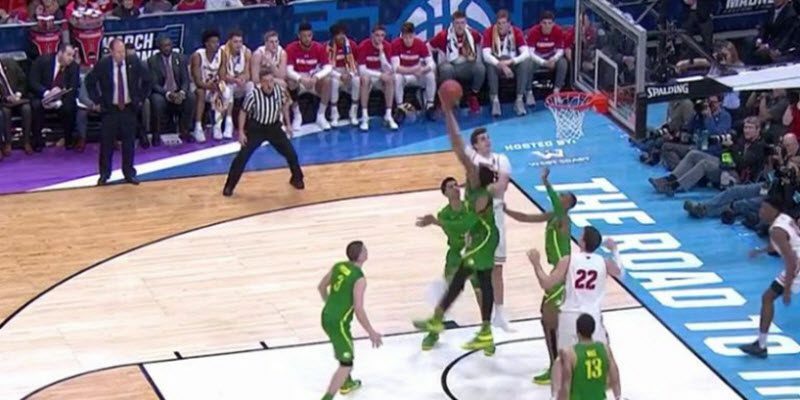 One thing the Ducks could do is clean things up around the rim. Sabally and Boley are reaching late, and the Ducks fouled too much on layup attempts by the Hoosiers. Sabally’s three-point shot is warming up again. Oregon will need it to get to Tampa. Her ability to finish with either hand at the rim is also outstanding. Sabally’s all-around game is a difference maker at both ends for the Ducks. Hebard sat a long stretch in the second half with her still sore knee. Oregon needs her healthy next weekend and Coach Kelly Graves sat her the moment he could. Ionescu’s 18th career triple double wasn’t a surprise to Oregon fans, but her greatness on the biggest stage is making her a star around the country. Altman now has 645 wins, 19 behind John Wooden. That’s good for 29th all-time. If he averages 20 wins through his extended contract (not hard to imagine), he’ll have 785 wins and be just outside the top 10. He’s also the 7th winningest active coach. With signing period looming in April, Oregon is still recruiting Cole Anthony and a couple wing scorers. I believe Oregon will look for another a 5th-year graduate transfer as well. Altman has had good luck with most of them. Last, UC Irvine Coach Russell Turner said his calling King a “Queen” during the game was meant as a sign of respect. Turner is competitive and that’s fine. But I don’t think anyone believes he meant it as a sign of respect. To me, that’s not how you lead young people. I get that there’s always going to be trash talking, and I’m sure King has heard worse on the playgrounds. It still doesn’t make Turner right. To his credit, King ignored it, lit Turner’s team up, and sent them home. Bob Rodes, the FishDuck.com Volunteer editor for this article, is an IT analyst, software developer and amateur classical pianist in Manchester, Tennessee.